Our DIY blogger, Janel Nell, shows us 5 ways to entertain in the outdoors. As temperatures start rising, the blue sky and warmer weather entices us to move our social gatherings outdoors. Whether you’re hosting a casual braai or a summer garden party, your outdoor dining furniture will be your best and most vital style investment. We are going to explore some fresh Alfresco living looks to suit your tastes and needs. If you love the slightly raw, industrial loft look, then you might consider combining timber and metal for your dining area. A timber table top with a natural stain finish can be complimented beautifully by a coloured metal outdoor chair. If you prefer a more muted colour scheme you can keep the chair in monochrome shades of grey, as per the picture on the left. However you can also brighten up the space by opting for a pop of colour. 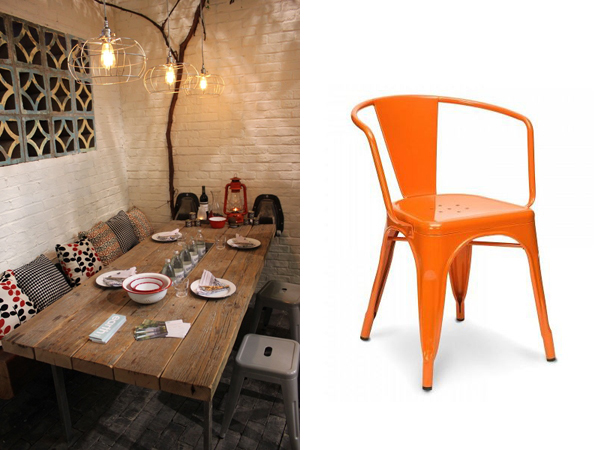 Local suppliers, Chair Crazy, have a striking orange coloured chair available. If you’re going for a relaxed yet sophisticated look, then the country chic style is the right one for you. A chunky timber table that is either left with its natural timber finish or combined with white painted accents is an understated centre piece. Timber framed chairs with relaxed linen upholstery finishes off this look. 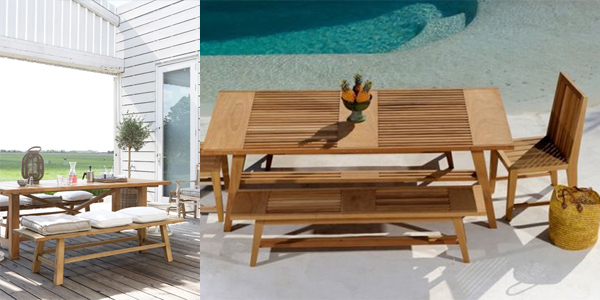 Block & Chisel has a lovely range of outdoor timber furniture. Tip: This type of seating works best for a covered veranda area to protect the furniture from the elements. Bench type outdoor seating is a winning option for a couple of reasons. The benches can be stored under the table, which is handy for smaller spaces. It is also quite practical for larger group gatherings and can be softened with some outdoor cushions. If you want to add a twist to this look, you can use contrasting end chairs in a different finish or style. 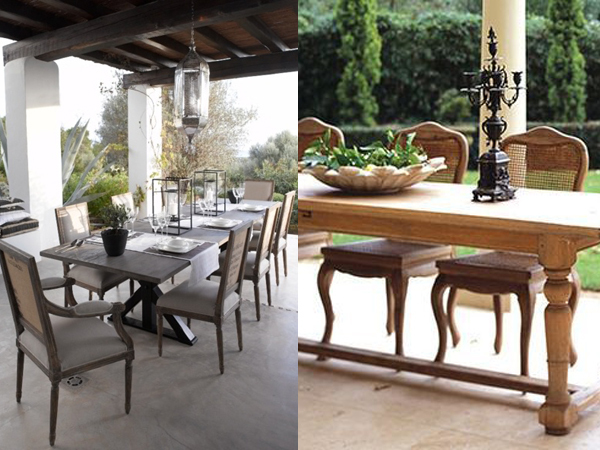 Bloc Outdoor Furniture stocks the bench dining set shown in the right hand image. As wonderful as it is to eat outside on a warm day, you also want to stay cool. A woven type seat is stylish and airy. White or black chairs create a modern fresh look. Mobelli stocks the set shown in the right hand image. UV protected plastic/ polypropylene chairs are a very versatile outdoor dining option. They contrast well with more traditional or rugged timber tables to create an eclectic mix. The Panton chair is one of the most iconic moulded chairs and can be purchased in a variety of colours. 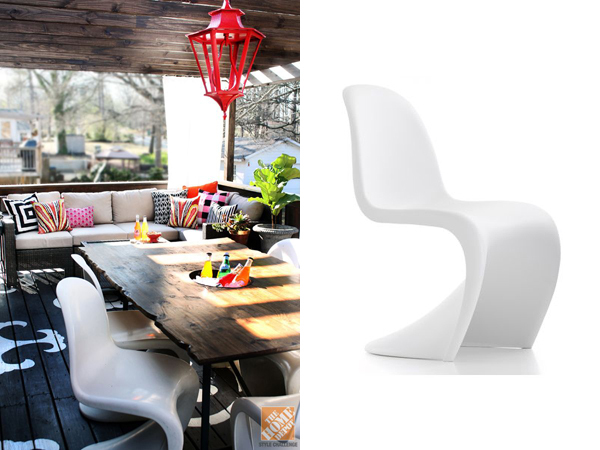 For a more timeless look, a white Panton chair is a great choice, such as those stocked at Chair Crazy. Interior Creators offers a specialised, online interior design services for homes as well as office/ retail space, promoting and fulfilling the “do-it-yourself” and “buy-it-yourself” trend. Interior Creators also provides access to products and service providers to allow clients to fulfil their design needs, in terms of finishes as well as furniture, both new and refurbished.